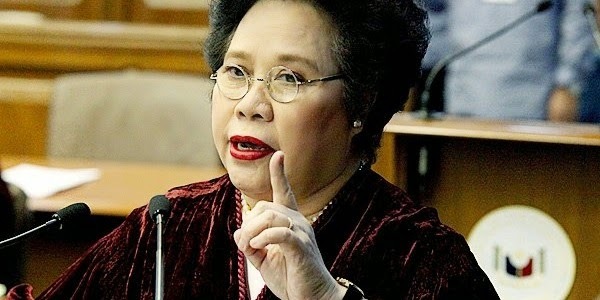 Manila, Philippines - Sen. Miriam Defensor Santiago on Tuesday reacts to the reports that so-called VIP prisoners enjoy extravagant accommodations in jails. "How can there be justice in our correctional system when we have a double standard between poor and rich inmates?" the senator asked. Santiago cited news reports of rich high-risk prisoners in the New Bilibid Prison staying in airconditioned rooms, enjoying contraband supplies such as illegal drugs and alcohol, and even taking in s*x workers. Some VIP inmates reportedly drive around the penitentiary grounds in golf carts, electric motorcycles, and tricycles. It was also reported that the maximum security compound has its own dress shops, wet and dry markets, fruit stands, as well as facilities such a jazz bar, plaza, and tennis court. "These prisoners are supposed to be experiencing punishment for their crimes, not taking a vacation. They are making a mockery out of the justice system by turning our jails into their own private resorts," she said. These reports prompted Santiago to file Senate Resolution No. 525, calling for a Senate investigation on the anomalous situation in the New Bilibid Prison. "The same thing is happening in other prison complexes in the country. If this can happen in a maximum security compound, who knows what else happens in other jails?" she said. Santiago also filed Senate Bill No. 1759, or the "No Frills Prison Bill", to eliminate luxurious prison conditions by mandating average standard living conditions and opportunities for every prisoner. Santiago's proposed law prohibits access by all prisoners to certain luxuries, such as TV-viewing inside cells, cellphones, and computers. It also imposes additional restrictions for prisoners serving a sentence for violent crimes. "Under the equal protection clause of the Constitution, all persons similarly situated should receive similar treatment. It does not matter whether you're a Johnny caught picking pockets or a Johnny charged with plunder. All detainees and prisoners, whether common criminals or senators, should have the same accommodations," she said.